The blend of cultures that has shaped the British overseas territory of Gibraltar over the centuries make it a fascinating place to visit. Here are 7 reasons why this part-British-part-Spanish-part-Moorish destination should be visited at least once in a lifetime. Gibraltar is the only European destination (pre-Brexit, anyway) where you can hang out with monkeys. The population of about 230 Barbery macaques that live on the 400-metre high plateau of the Rock are the only wild monkeys in Europe, one of Gibraltar’s most iconic sights, especially when perched on the cliff-edge munching on a banana. They will give you a friendly welcome when you arrive at the top, although be on the lookout as some are gifted pickpockets. It is said that when the macaques die out the British will lose sovereignty over Gibraltar. As if Brexit weren’t enough to worry about. Though the macaques might take them for granted by now, the views from the peak of the Rock of Gibraltar (reached by cable car) are worth a visit here alone. From its 400-metre roof, you look out over 2 continents: Africa lies just 13 miles across the Straits to your south, whilst Europe stretches out to your north with the sun-scorched mountains and plains of Andalusia. The north coast of Africa is also visible from Europa Point at the island’s southernmost tip, from where you can see Morocco’s Jebel Musa mountain; according to legend, the Musa was one with the Rock before Hercules smashed through them, creating the two Pillars of Hercules. From the top of the Rock, you have an incomparable position from which to survey the two countries – Morocco and Spain – that have combined with British culture to give this territory its unique ambience. Centuries before the British claimed control of Gibraltar in 1704 during the war of Spanish Succession, long periods of Moorish and Spanish rule had combined to give this intriguing place a mixture of cuisines, architectural styles and cultural mores that were added to by the arrival of northern Europeans. Nowhere is this mixture more evident than in the old town, where British pubs sit next to Arabic restaurants and Andalusian-style townhouses. Built in 1531 and originally used as a residence for Franciscan Friars (hence the name it has since retained), Gibraltar’s Convent has been the Governor of Gibraltar’s official residence since 1728. It is also said to be one of the most haunted public buildings in Europe. One of its more troublesome residents is known as the “Lady in Grey”, a Spanish nun who was walled-in alive in one of the bedrooms after marrying a man her father disapproved of. Apparently, she makes the night shift a dreaded prospect for security guards, who have reported alarms in long-disused rooms ringing out in the small hours and chains jangling behind locked doors. Gibraltar’s Great Siege Tunnels are some of Europe’s most fascinating historical attractions. They were built towards the close of the 1779-1783 Great Siege – during which Spanish and French forces unsuccessfully tried to seize the territory from the British – as a way of setting guns into the precipitous terrain of the Rock. It’s amazing to think now, as you wander this extensive labyrinth of caverns and corridors, that they were all dug by hand (with the aid of an occasional blast) under intense military pressure. They were enlarged and extended after the siege and during the Second World War. One of the unique pleasures of visiting Gibraltar is that if you fancy spending a few hours in Spain you can simply stroll across the border to the Andalusian town of La Linea de la Concepcion. This is by far the most hassle-free way of changing countries and affords you the rare experience of standing with one foot in one country and one in another. Due to how small Gibraltar is, you can walk from the centre of its old town to the cenre of La Linea in under an hour – and if you’re worried about getting lost, all you need to do is follow the signs to Spain. Alternatively, if you’re visiting from elsewhere in Andalusia, you can get the bus from Malaga to San Roque, from where it’s a 10 minute taxi ride or car journey to La Linea. One thing the UK does extremely well is a decent pint of ale and one thing the Mediterranean does well is endless sun and spotless blue skies – yet rarely can the two be enjoyed together. 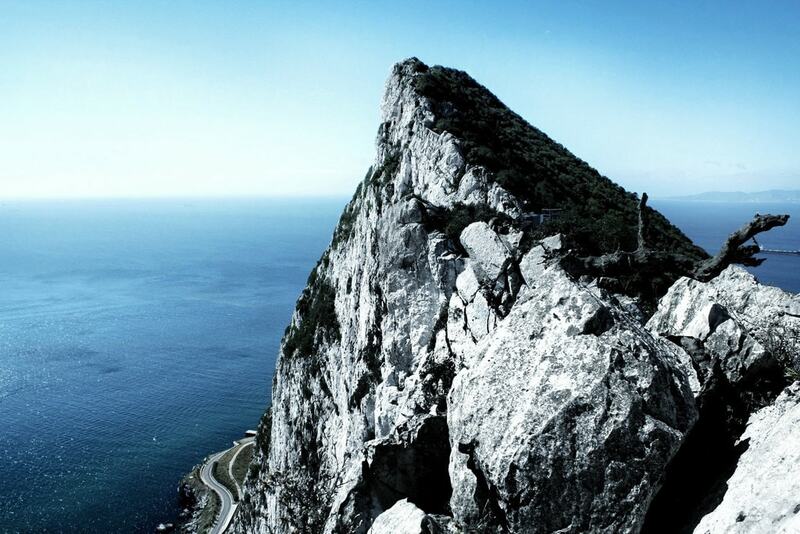 Gibraltar’s status as a British overseas territory and its position on the Iberian peninsula’s most southerly tip, though, means that these two great things are both in abundance here. All you need to do is take yourself to one of the best pubs – try the Horseshoe Inn on Main Street or the Lord Nelson on Casemates Square – order a pint of your favourite dark ale and head out to a sun-drenched terrace to enjoy it. Perfection.